As part call center company, a business normally known for high turnover, low morale, and a boiler room environment, BerylHealth created a special culture resulting in low attrition, high customer loyalty, and profits reinvested in employees. What BerylHealth does behind the scenes to take care of the needs of its internal family sets it apart. It operates with a true spirit of camaraderie; the loyalty of team members at every level; a leadership team that operates with a true servant mindset; and a CEO, Paul Spiegelman, who believes that everyone deserves a chance to feel important. He rewards people frequently, respects their efforts and opinions, and informs them of everything that impacts them. He gave away his car to an employee who walked to work, replaced another’s Christmas gifts when her apartment was robbed, bought a plane ticket for an employee to visit his dying mother, and sits for hours in a Santa costume while BerylHealth kids climb on his lap. Even the company name, defined as “a family of gems,” illustrates the emphasis on coworkers, the people who created the vibe behind his secret to passion, productivity, and profit. Read his book about how BerylHealth changes lives and discover how you can implement the same techniques to make your company a top place to work. “As I began to share Paul Spiegelman’s thoughts about “the secret behind passion, productivity, and profit,” I realized that there really isn’t a “secret” to be revealed. Rather, the challenge is to assemble and then – key point – retain those people who are so excited about being part of a given organization that they go what Napoleon Hill once characterized as “the extra mile” to add value to their organization and to its customers. It is no coincidence that many (most?) of those on Fortune’s annual list of the “most admired companies” are also #1 or #2 in their respective industries in terms of profitability and cap value. They also have the highest retention rate of valued employees and far more applicants for an open position than do any of their competitors. In fact, those who work for competitors are the most eager to work for them. The title of Spiegelman’s book is apt: If an organization’s employees (or if you prefer, as do Wal-Mart and JCPenney, associates) are not smiling, you can be certain that its customers aren’t. This is an especially personal book and it must be because Spiegelman is obviously a passionate as well as a thoughtful and sensitive person. However, what he shares is really not about him; rather, it is about others within and beyond the Beryl organization who have found joy for themselves and created joy for others in the modern workplace, one in which, regrettably, joy is seldom experienced. I especially appreciate his provision of “stories” shared by thoughtful and caring people such as Julia, John, Melanie, Michael, Lance, Jared, Lali, Juli, Maricela, and Rhonda. Throughout the narrative, Spiegelman also includes a number of communiqués between and among people who are struggling to understand important business issues, to solve problems, and to share (often with stark candor) their opinions about a given situation. However different high-performance organizations may be in every other respect, all of them are transparent in terms of communication, cooperation, and most importantly, collaboration. In the final chapter, Spiegelman explains that he wrote this book to “share simple secrets that might help other leaders successfully advance their business. I wrote it as an appeal for old-fashioned values in the commercial arena, with special emphasis on treating coworkers well.” The “stories” provided by others provide a human context for each of the “simple lessons.” In this instance, I am reminded of what Oliver Wendell Holmes once observed: “I would not give a fig for the simplicity this side of complexity, but I would give my life for the simplicity on the other side of complexity.” What Spiegelman and his Beryl associates share may seem “simple” and that’s true, but only if viewed within the context of Holmes’s observation. “Paul Spiegelman gets it. He knows that the secret to building a culture of excellence starts with a focus on people. 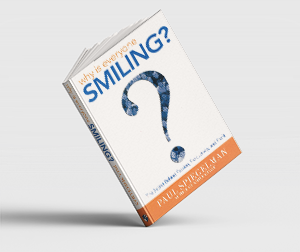 In his book, Why is Everyone Smiling?, The Secret Behind Passion, Productivity and Profit, (2007, Brown Books Publishing),Spiegelman demonstrates that when the leader shares a passion for excellence and empowers his staff to do the right thing at the right time for the right reason; great things will happen. As the CEO and co-founder of Beryl, Spiegelman has first-hand experience building a successful company from the ground floor up. He’s no stranger to the trials and tribulations of entrepreneurship but his steady, unwavering approach to focusing on the work environment and doing the right thing was a prescription for sure success. In order to build a reputation as a service-centered company that goes above and beyond the expected to thrill its customers, Beryl went above and beyond to excite and thrill its employees. The results have been stellar. This book is not written as a “how to” manual but rather as a story of one company’s journey from a tiny start up to a nationally recognized brand. From the beginning, the founders understood that employees’ loyalty leads to customer loyalty and ultimately a profitable business. These guys know that they need to be accessible, visible and approachable in order to gain their employees’ respect and trust. I especially appreciated Spiegelman’s candor about mistakes he made along the way and the important lessons learned in the process. “This is a great book. Spiegelman describes the ABC’s for becoming a great company – from building the brand to become a premium provider while at the same time being a top place to work. The first-person, connect to purpose employee stories at the end of each chapter are powerful. “I got your book earlier this week and I just wanted to write to thank you for sending it. I’ve actually already finished it; and more than just “read”, I took notes! It was a really amazing story, inspirational to hear about the successes and challenges that Beryl has faced and I found it incredibly helpful to hear about all the ideas and suggestions that you’ve implemented with regards to creating and sustaining a culture that supports to core vision of your business.. It truly sounds like you have an amazing, special place there, and one that you guard and guide carefully. I did, and it has changed my whole approach to business and life in general. Like the Beryl Companies, Site Selection Group, LLC formerly Trammell Crow Company – Site Selection Group, has chosen to remain a tight-nit community of employees. “It was wonderful! I want to buy copies for lots of folks at Mount Sinai. And I can’t tell you how excited I was to see my name and to read the references to Mount Sinai – the Survivor contest and Lara coming to consult with HR. And I loved reading about you, Barry and your story – about the things that have always impressed me about Beryl. And I enjoyed seeing the smiling faces of Angela, Jason, Jared, and others and of reading Angela’s note to you, Jared’s story, references to Linda, Lance and Lara. And the story you and Linda had told me about the guy who had another job. It was so motivating! I want others to read it so they know more about Beryl and know that the value we get is worth a lot more than the low bid. And so they can learn and be excited about your philosophy.